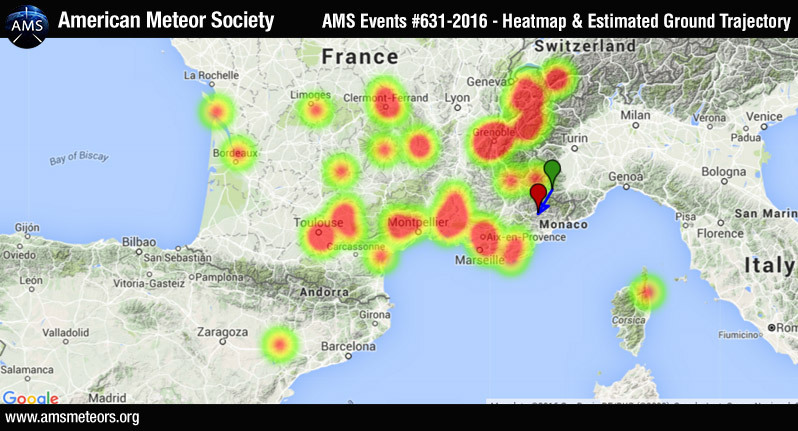 The American Meteor Society received over 55 reports so far about a fireball event over Southern France on Wednesday, February 17th 2016 around 17:20 UT (18:20 local time). The fireball was seen primarily from the Alpine region but witnesses from as far as Corsica, Switzerland and Spain also reported the event. Below is a video from the event caught during a Rugby game. Could it be anything to do with iss cargo ship release (#Cygnus)? This object was most likely a true meteor and not space junk as the duration was quite short. Re-entering space junk usually takes a minute or so to completely disintegrate verses a few seconds for a true meteor. I live/work in southern Indiana right across Ohio river from Louisville, Kentucky, (USA), was there a meteor visible last week or last 10 days approximately 9:45pm, DST? I called a friend when I arrived home and was teased about it, I could find nothing in the news. It would have been in the northeast sky, I live in a very rural area, it was very dark, and I saw a quick flash across the sky.